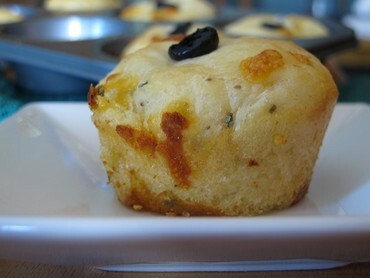 These no knead rolls are light & airy and filled with sharp cheddar cheese and savory spices. Measure the first 7 ingredients into a bowl; blend. Set aside. Pour the water into a mixing bowl; add the yeast. Let stand 3 to 5 minutes; stir. Add the egg and ½ of the flour-mixture. Beat 2 minutes with electric mixer on medium speed, or by hand until smooth. STOP MIXER. Add the rest of the ingredients and beat again with a spoon until smooth...1 to 1-1/2 minutes. Scrape down batter from sides of bowl. Cover. Let rise in warm place until doubled...about 30 minutes. Meanwhile, grease 24 medium-sized muffin cups. Beat down raised batter in about 25 strokes. This is a sticky batter. Spoon into muffin cups, filling no more than half full. Place one olive into the center of each cup. Tap pans on table to settle the batter. Let rise until batter reaches tops of cups...15 to 20 minutes. Bake 12 to 15 minutes in preheated 425°F oven. Remove from pans and cool on rack. Brush with butter. Note: Any size muffin cups may be used, just so the batter fills the cups only half full. Recipe featured at Bran Appetit.